Tabletop Weight: First is the tabletop itself. Most conventional tabletops are made from MDF (medium density fiberboard), which depending on the thickness and the type of lamination, will typically weigh between 4 and 5 pounds per square foot. That means that a 30” x 72” tabletop would likely weigh somewhere between 60 and 75 lbs. Hardwoods, glass, and metal tops are obviously going to weigh a LOT more. Side Load Stresses: Even if you added up all the devices on top of your desk, added them to the tabletop weight, and it came out to be well less than the published capacity of the lifting motors, you may not be in the clear. The reason is “side load stresses.” When a manufacturer publishes the specification of the lifting power of its linear actuators (the legs), this reflects ideal conditions. Meaning that all the weight on top of the frame is to be perfectly centered along the crossbars that connect the two legs. It also assumes that the desk is perfectly level – and if you haven’t adjusted each of the four corner foot pads on your desk yet, it likely isn’t level. It is important to make sure your electric desk frame is completely level, to remove any torque stresses and minimize side load strain on the linear actuators. 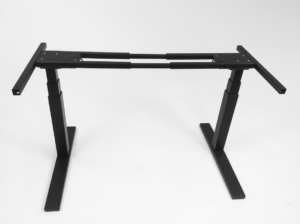 Desk Frame Unevenness: Any unevenness in the desk frame will put undue torquing forces on the linear actuators, as will any unevenness in the weight distribution of the items atop your desk. Since most people mount their monitors on edge-clamped monitor arms, there’s already a fair amount of weight imbalance on the typical desk. 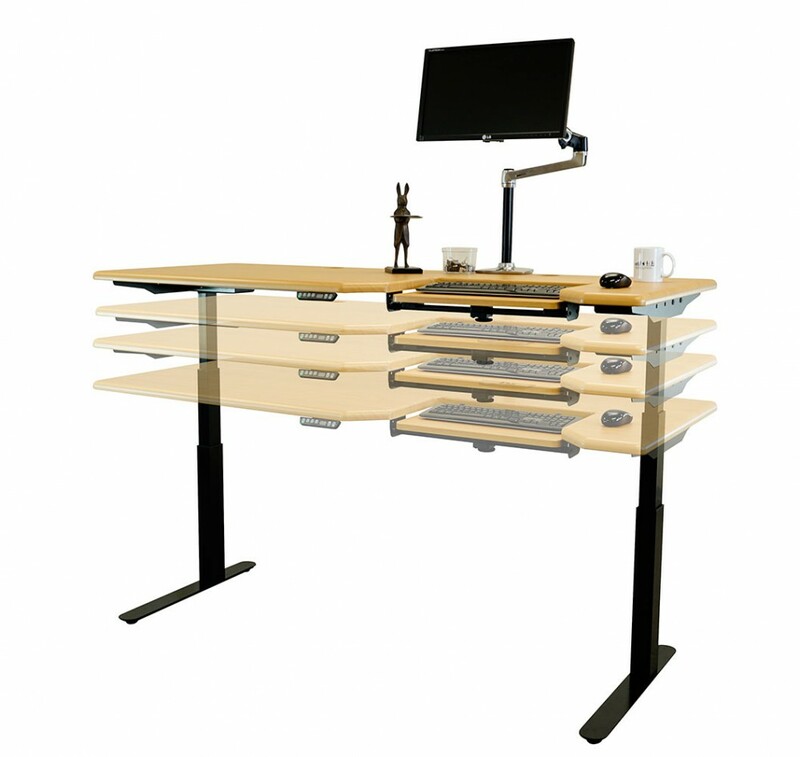 With three or four monitors and their heavy duty monitor arms, that can add a fair amount of side loading stress. In addition, longer tabletops will naturally bow in the center a bit, if heavily weighted. This also adds more side-load stress on the legs. So you can see where this is going. There isn’t a practical way for someone without a physics degree to take all of these factors into consideration and assess the true lifting load on the legs of their desk. You might therefore logically presume that a higher lifting capacity rating is going to be better, but there’s another critical factor in this equation that’s a lot less obvious. And that has to do with the machining tolerances of the tube segments of the legs and the thin gaskets that run between them. Linear Actuators: There are dozens of linear actuator manufacturers in the world, with historical applications in chair recliners, hospital beds, and other various medical equipment. The best ones are designed for medical, aerospace, and industrial applications that put a premium on reliability, as these will often have the tightest tolerances. On the other end of the spectrum are cheap, Asian-made actuators that have sloppier tolerances, designed for the mass market. To be sure, there’s a spectrum of manufacturing quality among Asian producers, too, some utilizing highly modernized assembly plants, but many cranking them out in less-than-modern, poorly lit, sweltering manufacturing lines, with nominal quality assurance steps. In our experience, having lab tested many different desks built on many different bases and actuator legs, we’ve learned that an American or European-made base built by robots, with a 265 lb. lift capacity, will often outperform an Asian-made base built with manual tooling sporting a 330 lb. or greater lift capacity. As you might have guessed, this is because the latter will have sloppier machining tolerances on the leg segments, and the gaskets between them. This is particularly an issue for desks with longer desktops, six or seven feet long, where side loading can become a very serious consideration. More Power (Less Problems): As a rule of thumb, more power is going to be better, but how much do you really need? 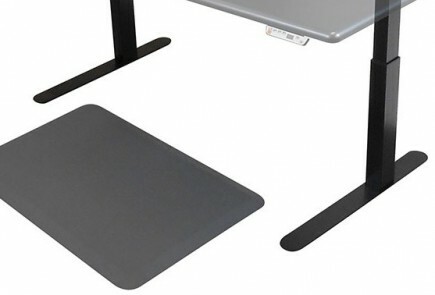 About the cheapest desk bases you’ll find out there will offer 150 lb lift capacity, and while this sounds sufficient for your laptop and iPhone, these tend to have a shocklingly high failure rate. The most painful examples of this is the attractively priced but woefully underpowered IKEA Bekant and the extraordinarily cheap (and we mean that in every sense of the word) Autonomous SmartDesk; see the individual reviews and user comments on those. 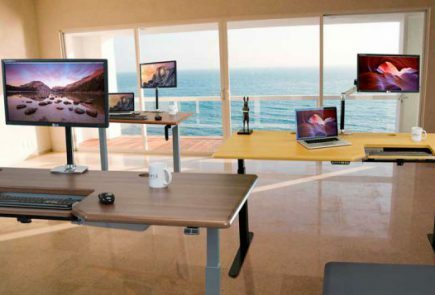 Most electric desks these days have a published lift capacity of somewhere between 220 and 330 lbs, and all of these should do fine with a 4’, 5’, or even 6’ desk. Any larger and we recommend sticking with an American or European-made base. Another reflection of quality will be the warranty term. American-made bases often come with ten years of warranty coverage on their motors, compared to one to two years on cheap Asian bases, and five years on top-end Asian bases. We told you it’s a nuanced answer. Figuring out whether a particular base will be well-suited for your lifting requirements requires a knowledge of the manufacturing quality of the linear actuators that are used – not just their published specifications – and also an understanding of the weight distribution on top of your desk. For certain, keeping the weight centered along the cross bars and away from the center of the desk as much as possible will go a long way to preserving the useful life of your motors. It’ll also minimize wear on the gaskets. Even if you think your desk is so overpowered that it can tolerate a lot of side-loading, remember that the wear on the gaskets will result in your desk getting shakier and noisier over time. Because most people do have the weight on top of their desk biased towards the back edge, you’ll see the better bases designed with a cantilevered, or “C-leg” base, versus a “T-leg” base. This is one of those times when the only way we can simplify the answer is to say “you get what you pay for, and you pay for what you get.” Higher-cost bases will have more metal, and that means more rigidity, and lower risk of side loads straining on the motors and wearing down the gaskets. You should also see warranty term go up with cost. Still have questions about a particular desk you’re looking at buying? Check first to see if we’ve reviewed it yet, but remember you’re always welcome to call one of our product experts at the SitLess demonstration showroom for more information.